Classic Industries has offered restoration and performance parts for the iconic Chevrolet Impala for over a decade. Their extensive inventory of reproduction parts and performance accessories offers nearly everything needed to restore or modify an Impala, Bel Air, Biscayne, Brookwood, or Caprice. 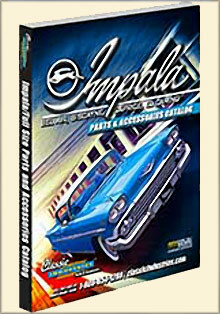 Enter the Promo Code - C73FU - at checkout on the Impala Full Size from Classic Industries website. From interior parts and soft trim to exterior sheet metal, moldings, emblems, and weather-strip, you can trust the Classic Industries Impala parts catalog for all of your restoration needs. Power - Invest in the right Chevy Impala parts to pump up your powertrain with GM Performance engines, ignition, radiators, shifters, clutch components, tuning modifications, exhaust systems, fuel pumps, carburetors and more! Performance - Shop the full size Impala parts catalog online for a vast selection of performance parts including suspension packages, control arms, sub frames, coil springs, shocks, sway bars, strut braces, brake packages, disc brake conversions, stainless brake lines, and more! Style - Sheet metal, spoilers, bumpers, lamps, trunk, valance panels, grills, trim pieces, weatherstrip, molding, exterior emblems, body decals, wheels, tires and more! Accessories - Upholstery, door panels, carpet, floor mats, seat belts, seat frames, seat foam, interior trim, performance gauges, audio, consoles, steering wheels and more! The Classic Industries Impala Parts catalog is your leading source for Chevy Impala parts and accessories that will help your revive and restore every inch of your full size Impala.